Habaki : Family crest engraved on the gold foiled double habaki. Blade length : 62.12 cm or 24.45 inches. Sori : 1.5 cm or 0.59 inches. Width at the hamachi : 2.99 cm or 1.17 inches. Width at the Kissaki : 1.87 cm or 0.73 inches. Kasane : 0.57 cm or 0.22 inches. Era : Early Edo period Kanbun era. Shape : About 5cm suriage and wide and thick healthy blade. Jitetsu : Itame hada well grained with jinie attach chikei work. Hamon : Niedeki gunome midare and suguha with very thick nioikuchi and also fat ashi work. In Hamon, there are many sunagashi and kinsuji scatter. Special feature : Nagasone Okimasa is 2nd generation Kotetsu. He was who was adopted son of the Kotetsu. So he was called secound son of Kotetsu who was a top ranking swordsmith in Shinto era. His subject is very similar with first generation Kotetetsu which is wide thick nioikuchi suguha and gunome midare with thick and fat ashi. 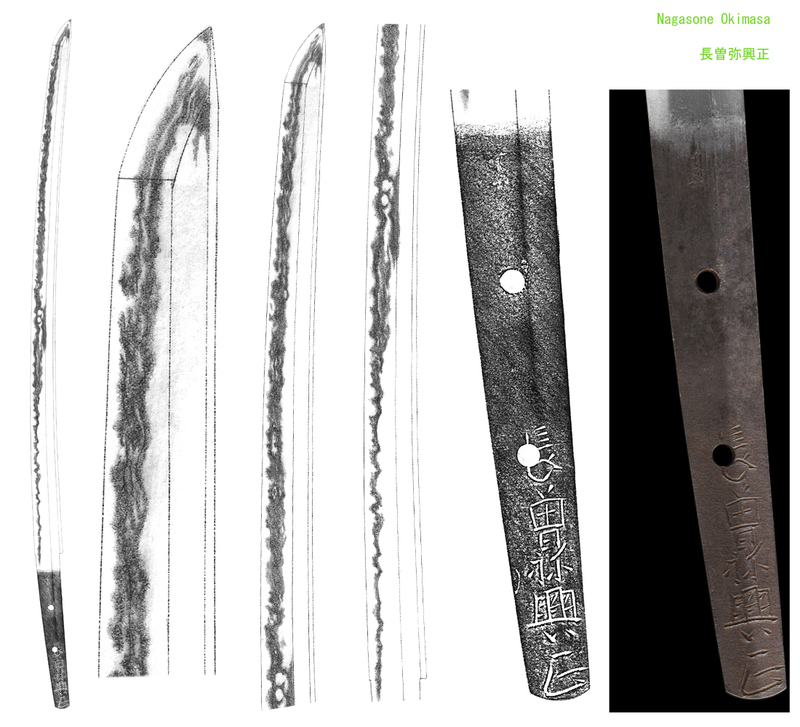 This sword remind us Kotetsu hamon and Jigane. Koshirae : Very nice good condition Koshirae (mounting). Tsuba : On the round shaped with kizami iron tsuba, some geese and some design are engraved open work. Fuchikashira :On the shakudo plate, with stitch design are engraved with gold color. Menuki : Kiku flower is engraved with gold color. 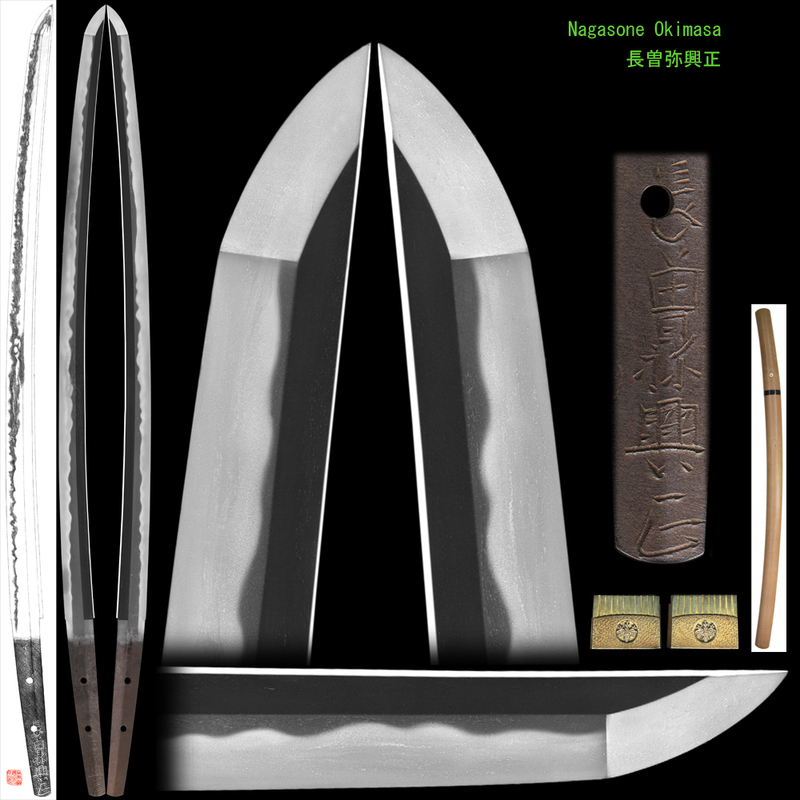 Wakizashi:Bizen Koku Ju Osafune Sukesada.